Last night we finally made it out to California's Great America for Halloween Haunt! Since my teenage daughter and many of her friends going to the Haunt, we volunteer to take them all and make a date night out of it. #NoTwitterTodd and I drop them off at the main gate during opening, and once they're safely inside the park, we go out for a nice, grown-up dinner nearby. We usually choose a restaurant the daughter doesn't like since we do a lot of grown-up dinners with her at her favorite places anyway. (We kinda like her.) After dinner we make our way back to Great America and enjoy the Haunt on our own until we meet up with the kids at closing. It makes for a perfect date night for us and a great time for her and her friends - with a safe ride home. There are mazes, haunted attractions, rides, scare zones and shows in addition to food and drinks. Lots of fun! I love seeing the carousel lit up at night. 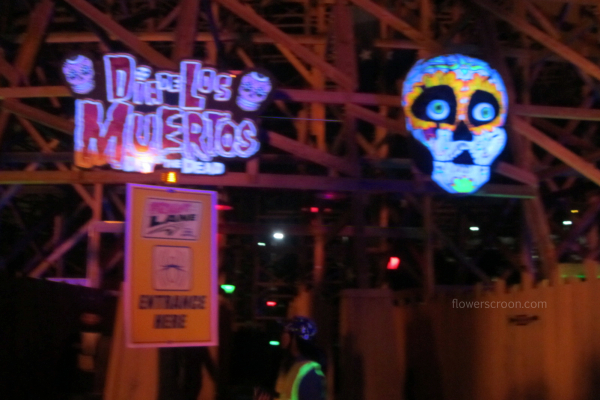 New this year is the Dia de Los Muertos attraction. Fun, scary, pretty and great music. Just be sure to watch out for the Chupacabra at the exit! The scare zones spread throughout the park are just that - scary! Luckily for me I had someone to hold on to as we walked through the fog. 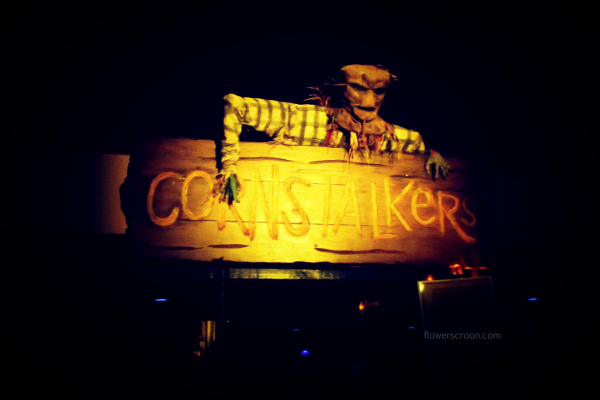 The Cornstalker maze is a creepy Halloween classic. Funky dream beats from Blood Drums. Spurting flames add to the drama. Halloween Haunt is open Fridays, Saturdays and Sundays through October 27th. Be sure to check the website for times and special pricing. The Haunt is not recommended for kids under the age of 13. The good news is, your kids will have a great time during the day at Great America's Snoopy's Trick-or-Treat Festival. A not-scary, cute event being held at the park from 12:00 - 4:00pm Saturdays and Sundays through October 27th. See my post for photos from Snoopy's Trick-or-Treat Festival.